Earth has a steadily growing population and a finite amount of resources with which to provide humans food, warmth, clothing, shelter, and the other necessities of life. Many such resources—minerals, materials, and manufactured goods—contain economic value even after their useful life is over and can, and should, be recycled where possible. Doing so only not only helps conserve resources, energy, and landfill space, it can also help prevent pollution from contaminating our land and water. For example, electronic waste—even that from some of the emerging “green” technologies, such as photovoltaic panels—can contain heavy metals that are harmful to the environment if disposed of improperly. The most effective way to reduce waste is to not create it in the first place. Manufacturing a product requires energy and raw materials that typically must be extracted from the earth. Then, the product must be fabricated, packaged, and transported to market, which involves the expenditure of further energy and resources. Opting not to purchase goods that are unessential—or at a minimum choosing reusable bags/packaging to carry such purchases—helps reduce societal consumption of these materials, some of which are non-renewable. As a result, reduction is the most effective way to conserve natural resources, reduce waste, and protect the environment. Reduction is fine—up to a point. But it can never bring consumption of resources, whether renewable or not, to zero. After reducing one’s consumption of materials/products, the next most effective way to conserve natural resources is to reuse them, where possible. Many everyday household items—for example, outgrown clothes or old computers—can be donated to charities or schools. This prolongs their useful life and means that the recipients of such goods avoid having to purchase new products. 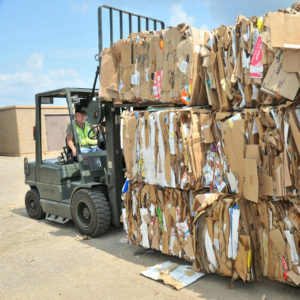 Many goods and materials can be recycled after use. Cans can be melted and fabricated into new containers. Industrial by-products such as coal ash can be repurposed as a substitute for cement, helping reduce the greenhouse gas emissions associated with concrete production. Auto batteries contain valuable recyclable materials, such as polypropylene, and others that are hazardous to the environment if disposed of carelessly, such as lead and sulfuric acid. Some materials in lead-acid batteries can be recycled to help manufacture new batteries, while others can be recycled for use in products such as laundry detergent, as well as in glass and textile manufacturing. Municipal Solid Waste (MSW) comprises everyday items that are used, disposed of, and enter the waste stream, including product packaging, food scraps, clothing, furniture, appliances, and grass clippings. MSW does not include industrial, hazardous, or construction waste. Recycled items, meanwhile, are taken to a materials recovery facility that separates and prepares the materials for marketing to manufacturers for their reuse. Recycling items in this manner saves landfill space, conserves raw materials, and helps recoup some of the intrinsic value of the recycled items to provide “green” jobs for those who work in this industry. What Items Can Be Recycled at the Curbside? What you are permitted to recycle varies according to where you live. Contact your contracted curbside recycling company for details on what they will accept. 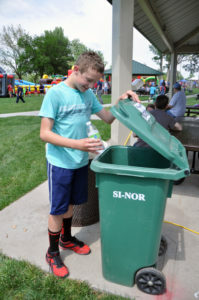 Rules also vary by municipality and service provider as to how they will accept recyclables. 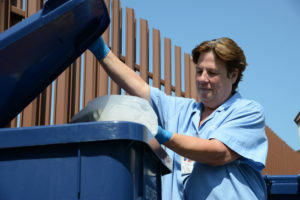 Increasingly in the U.S., consumers are being allowed to put all of their recyclable items into one bin—known as single-stream recycling—for curbside collection. Aluminum is one of the most valuable materials in the consumer waste stream. Recycling aluminum takes 95 percent less energy than manufacturing it from raw materials. For this reason, beverage can manufacturers strongly encourage aluminum can recycling to help them save energy, money, and natural resources. Aluminum foil recycling, however, is not accepted in many curbside recycling programs because it is frequently contaminated with food. Steel, like aluminum, contains significant embodied energy and is highly recyclable. Steel cans, which comprise roughly 90 percent of the canned food market, can be recycled, melted, and manufactured into new cans, as well as other products. Glass containers, such as those commonly used to package food and beverages, are generally recyclable. However, some recycling systems will only accept certain colors of glass; check with your curbside recycling company for restrictions. Ceramics, mirrors, and light bulbs typically are not accepted for curbside collection. Paper comes in many forms, including magazines, newspapers, cardboard, paperboard, mail, and office paper. In most instances, these materials can be recycled, pulped, and used to make new paper products. Paper that is to be recycled should be free of any food residue. Plastics, because they are manufactured from many different resins, constitute a special category of material and must be treated carefully. Generally, bottles, jugs, and jars are accepted in most recycling systems, but must be cleaned of food waste. Many plastic containers carry a number on the bottom, from 1 to 7, indicating the polymer from which they were manufactured. Curbside programs commonly accept #1 and #2; however, many systems do not accept all seven types. 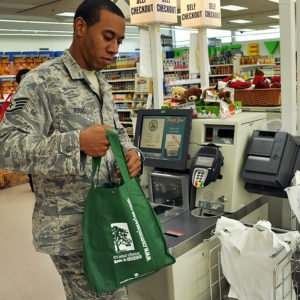 Plastic grocery bags are not accepted by curbside programs and instead should be recycled at the grocery store. If you have questions about the recyclability of a particular plastic item, contact your curbside recycling hauler. Some consumer waste commonly generated by households and businesses should not be thrown in the trash or recycled at the curbside. 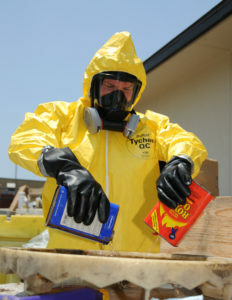 E-waste, batteries, fluorescent bulbs, paint, and motor oil can contain hazardous materials requiring special handling. Electronics—such as computers, cell phones, televisions, and printers—variously contain arsenic, lead, mercury, beryllium, cadmium, and other materials that are toxic and could potentially leak into the environment if disposed of in a landfill. In many states, disposing of such items in the trash is illegal. Some of these products can also contain personal information that could jeopardize their former owner if it were to end up in the wrong hands. E-waste instead should be dropped off at designated electronics recycling facilities or participating big box retailers, such as Best Buy and Staples. Alternatively, some waste haulers such as Waste Management, for a fee, will ship a box to your house that can be filled up with e-waste and returned to the company for safe recycling. After receiving e-waste, recyclers then strip the products for usable or recyclable materials, such as aluminum, gold, and silver, and dispose of hazardous materials responsibly. Batteries, like e-waste, can contain materials that are hazardous if disposed of in landfills. Commonly used consumer batteries such as lithium-ion, nickel-metal hydride, nickel-zinc, and silver-oxide batteries contain valuable heavy metals that can help pay for the cost of their recycling. They can be dropped off at designated recycling centers and select big-box retailers, depending on the specific type of battery. Single-use batteries such as alkaline and lithium do not contain heavy metals, and consumers may have to pay a fee for their recycling. Call2Recycle operates a network of collection centers where dry-cell consumer batteries weighing 11 lbs. or less can be dropped off and recycled. Both Call2Recycle and Earth911 offer online resources to locate battery drop-off sites across the U.S.
Fluorescent light bulbs (as well as compact fluorescent light bulbs, i.e., “CFLs”) contain small amounts of mercury, a toxic metal that can be poisonous to humans and is unsafe to be landfilled. In some localities, disposing of fluorescent lights in the trash is prohibited. Recycling CFLs and other fluorescent bulbs allows the reuse of the bulb’s glass, aluminum, mercury, and other materials. While CFLs can be recycled via retail drop-offs and mail-in programs, recycling options for fluorescent tubes are more limited. Earth911 has a fluorescent tube recycling locator. Paint generally comes in two varieties: water-based (“latex”) and oil-based (“alkyd”). Water-based paint in many locations can be taken to a transfer station, where high-quality paint can be sorted and recycled for reuse. Oil-based paint can’t be recycled and so must be disposed of as household hazardous waste (HHW). For localities that don’t offer HHW collection, the paint can be left to dry and thrown in the trash. Motor oil that has been used can be reprocessed to become usable again—as heating oil, marine fuel, or even new motor oil. Motor oil can be brought to an oil change shop that accepts used oil or to a household waste recycling facility. Advance Auto Parts and some Jiffy Lube stores provide this service. China’s import ban on certain plastic wastes will strand 111 million metric tons of trash by 2030, say @UGANewMaterials researchers. U.S. consumers throw away $2 billion of medications annually; most wind up in landfills, where they can enter the water supply. Four times more food is wasted by end users—consumers in their home and customer-facing businesses—than at the farm or the slaughterhouse. China’s waste import restrictions make it pricier to collect/process recyclables than they’re worth, says @RepublicService‘s Pete Keller. Crushed beverage cans can be hard for recycling centers to ID as aluminum and thus contaminate other recycled materials, says @AluminumNews.